Whether you are there to jump into the wine of the Barossa, or to watch the cricket, Adelaide is a great base. At Mad About Sports we have pulled together the best packages the web has to offer when you visit the city of churches. AAT Kings' one day Kakadu National Parks Sightseeing Tour includes a visit to Nourlangie Rock, Yellow Water Billabong Cruise & Aboriginal cultural experiences. Depart from Darwin on AAT Kings' one day tour and enjoy the sights as we travel through tropical country. Highlights include Adelaide River War Cemetary, Katherine Gorge Cruise, Nitmiluk National Park and Edith Falls. Lunch is included in this tour. On this 2 day tour of Kangaroo Island, Australia's third largest island. We visit all the highlights on the island including Remarkable Rocks, Seal Bay, Cape Du Couedic and Flinders Chase National Park. Experience up-close wildlife encounters with our knowledgeable tour guides on this Advance Eco-Accredited tour. Action packed experiences, including sand-boarding, optional quad-biking, snorkelling and hiking through Flinders Chase NP. All meals, accommodation and National Park fees included. On this 3 day tour we explore South Australia's majestic Flinders Ranges.We travel the geological trail through the Brachina Gorge. This gorge traces the geological history of the area for hundreds of million years. Experience a true Australian adventure with glow worms, an abundance of native wildlife and spectacular scenery combining the breathtaking Great Ocean Road and world famous 12 Apostles and London Bridge, with the hinterland of Grampians National Park and its typically rugged Australian landscape. On this 5 day tour we spend 2 days on Kangaroo Island, Australia's third largest island. We also spend 3 days touring South Australia's majestic Flinders Ranges, including Kangaroo Island, McLaren Vale and Flinders Ranges. On this six day tour we visit South Australia's majestic Flinders Ranges and the vast outback. Sites along the way include The Oodnadatta Track and the opal wonderland of Coober Pedy and it's famous 5300km long dingo fence. On this 6 day tour we spend 2 days on Kangaroo Island followed by 4 days touring the South Australian outback. We travel the Oodnadatta Track visiting mound springs, the Old Ghan railway, William Creek Hotel and Coober Pedy. On this 7 day tour we travel through South Australia's vast outback to Ayers Rock, Kings Canyon and Alice Springs. We spend two days at Uluru and Kata Tjuta National Park where you'll see the true Australian outback. Return trip to Adelaide is available if required. Join us on our personalised all inclusive 8 day Executive Getaway. Experience the unique wildlife, pristine coastline, wilderness of enormous diversity and meet some genuine Australian locals! This Day in The Barossa is a world-class experience! Taste some of Penfolds iconic wines before moving into the lab to blend and bottle your own masterpiece. Take in a delicious lunch at Salter's Restaurant, then enjoy an afternoon of tasting and touring - the ultimate Day In The Barossa Valley! 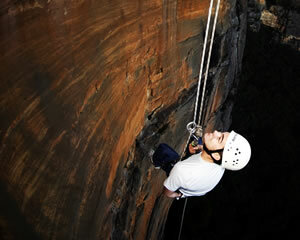 This abseiling adventure is designed especially for those who are seeking a real thill. 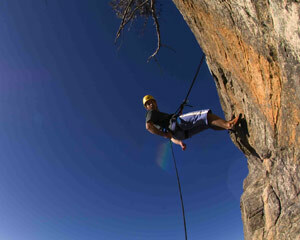 Abseiling (sometimes called rapelling) is the art of descending a vertical cliff face by use of ropes. A must for outdoor thrill seekers! Few things compare to the sensation of adrenalin you feel as you first step off the edge of a cliff. Abseiling, Half Day - Accept the challenge! 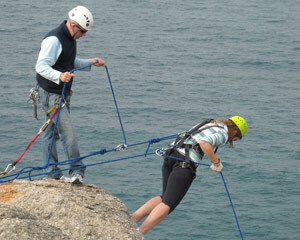 Abseiling, or rappelling, is basically a method of descending a rope in a safe, controlled manner. Roar up the Adelaide Foothills winding roads away from the city limits to Mt. Lofty Summit, where you will have the best vantage point to view Adelaide and it's Metropolitan suburbs, returning with a rush down the South Eastern Freeway through the Heyson Tunnels back to city limits. Tour through Adelaide - At the conclusion of your Adelaide City Tour 581, take a scenic cruise along the Torrens on board the famous 'Pop-eye'. Alight at Adelaide Zoo to visit Wang Wang and Funi - the only endagered Giant Pandas in the Southern Hemisphere and the first to live in Australia! "Brand new AFL collectable Toyota MR2 Spyder with opening doors, club logo on both doors and bonnet and club name accross the windscreen." 30ml spirit dispenser with team logo and a great collectable for any bar room.This product is official endorsed AFL merchandise and earns cash for your team.So everybody wins! Big kids and little kids alike can show their support this season with this new 3D wrist band with adjustable clip. This product is official endorsed AFL merchandise and earns cash for your team.So everybody wins! All Official AFL Neoprene drink coasters.This pack consists of 4 x 5mm coasters made from 100% thermal wetsuit.This product is an official AFL endorsed product and earns cash for your team.So everybody wins! Brand new 6 can cooler tube. Stores six standard cans for easy and insulated transport with AFL team tags on all zips and club logo.. This product is official endorsed AFL merchandise and earns cash for your team.So everybody wins! Brand new AFL Mitchell heavy duty black embossed vinyl pool table cover. Fitted cover with stitched seams on the corners. This product is official endorsed AFL merchandise and earns cash for your team.So everybody wins! Brand new tall acrylic tumbler with team logo holds a whopping 550mls. This product is official endorsed AFL merchandise and earns cash for your team.So everybody wins!